Thus Nadir Shah decided to invade the Mughal empire. 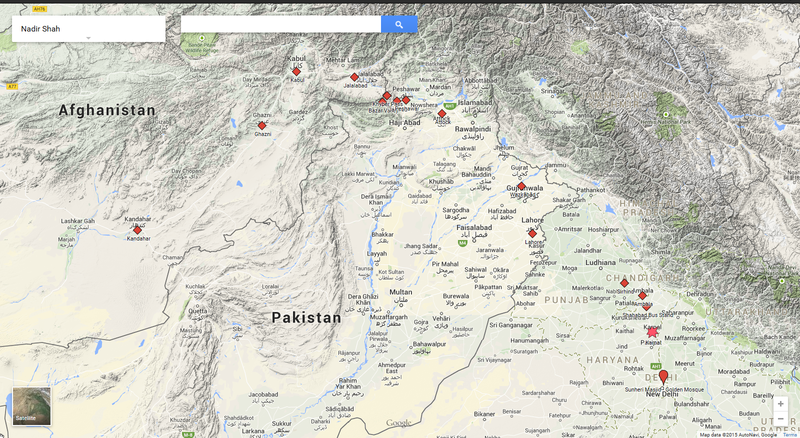 His path from Kandahar onwards can approximately be described thus: Kandahar to Ghazni to Kabul to Jalalabad to Jamrud to Peshawar to Attock to Wazirabad to Lahore to Sirhind to Ambala to Azimabad to Karnal and then to Delhi (see map). This was accompanied by much massacres, looting, and sacking of towns and regions in-between. From Kandahar, Nadir Shah conquered Ghazni and then Kabul. All this even as he kept professing to the Mughals that he had no territorial ambitions. He even "accredited an envoy to the Court, but the envoy was killed at Jalalabad." Nadir Shah therefore sacked Jalalabad as a punitive measure. The Mughals did wake up somewhat after the fall of Kabul, as they realized that Nadir Shah had not kept his word - which should not have come as any surprise. 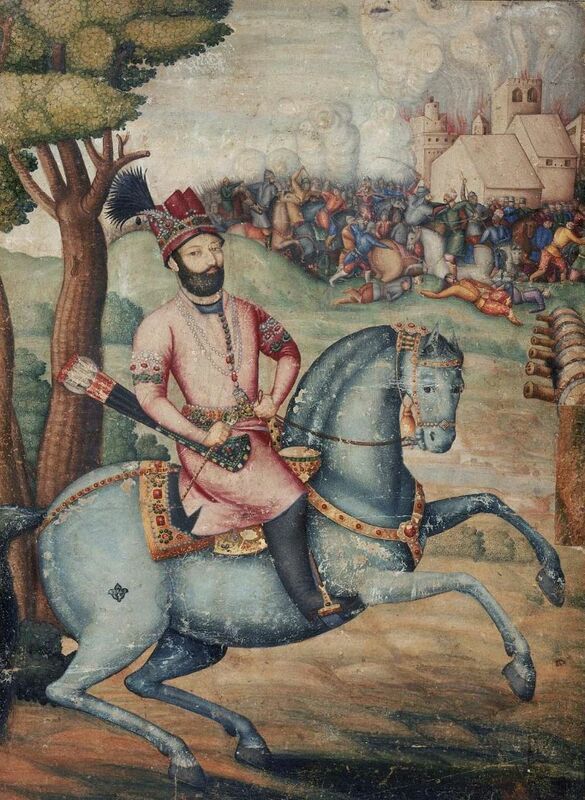 Urgent messages sent to Rajput princes for help did not elicit any response "worth the name." Even as the emperor called for Burhan-ul-Mulk, Sa'adat Khan, from Awadh, he held a "council of war" and it was decided that "the nobles should march to Karnal and wait for the enemy there." Muhammad Shah accompanied the army. Meanwhile, Nasir Khan, the governor of Peshawar and Kabul, had appealed to the Mughal emperor for reinforcements. This was however seen at the Mughal court as a ploy to "extort gold." Thus, no help was given; Nasir Khan was defeated and taken prisoner by Nadir Shah who had cleverly bypassed the Khyber Pass and advanced straight to Jamrud via Bazar Valley. Peshawar was now easily occupied, "and the region between Peshawar and the Indus was thoroughly sacked." As Nadir Shah neared Lahore, Zakariyah Khan, the Mughal governor, decided that discretion was the better part of valour, and surrendered to Nadir Shah by "offering a gift of 20 lakhs of rupees and several elephants." Thus Nadir Shah arrived at Sirhind on February 16, 1739. The army had reached the plains, and battle loomed. Nadir Shah "deposited his heavy baggage and harem" at Ambala, advanced to Shahabad - a little more than fifty kilometers from Karnal. Sa'adat Khan (summoned from Awadh) had arrived with his tired troops and gone to "pay his respects to the emperor." What followed next is in equal measure comedic and tragic. While Sa'adat Khan was away, he got news that the "Persians were plundering his baggage." Unable to restrain himself, he rushed with his men "to save his baggage." There was no planning, no strategy behind this action. The Persian army "feigned retreat", Sa'adat Khan pursued them, and thus "lost all contacts with the base." Frantic appeals for reinforcements resulted in a paltry cavalry of "about 8,000 or 9,000" being sent to Khan's assistance. Thus was fought the Battle of Karnal on the 24th of February, 1739. 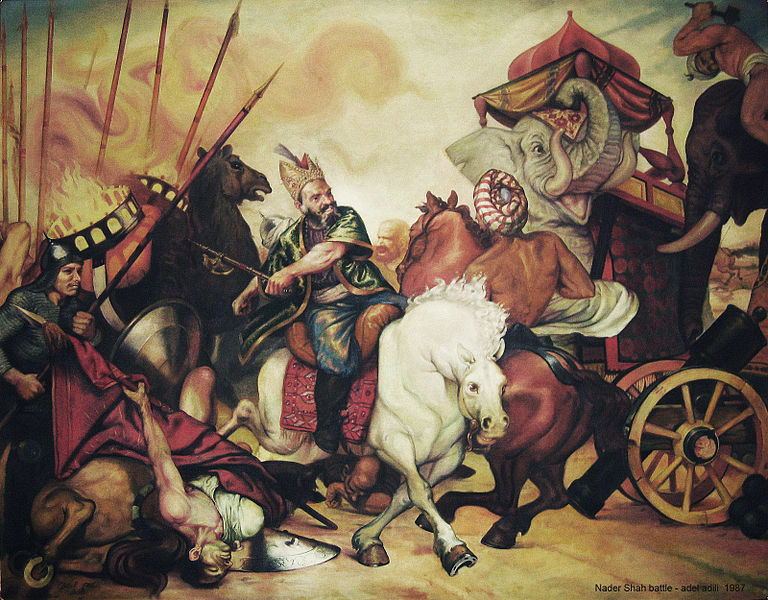 The Mughal army was routed, Sa'adat Khan was wounded and taken prisoner to Nadir Shah. Here, a resourceful and tactful Khan was able to convince Nadir Shah that Muhammad Shah was still "in a position to fight on equal terms." He also persuaded Nadir Shah to send for "Nizam-ul-Mulk, who was the 'key of the empire'" to negotiate. Peace was thus negotiated by offering an "indemnity" of 50 lakhs of rupees to Nadir Shah, which would be paid in installments - "20 lakhs immediately, 10 lakhs at Lahore, 10 lakhs at Attock, and the balance at Kabul." Nadir Shah agreed to not advance towards Delhi. That should have been the end of the matter. But this is where envy and treachery reared their heads. In the Battle of Karnal, Khan-i-Dauran, the Mir Bakshi who had come with the additional cavalry to Sa'adat Khan's aid, had been killed. Upon Nizam-ul-Mulk was conferred the "title and post" of Mir Bakshi by Muhammad Shah. Sa'adat Khan - Burhan-ul-Mulk - had been coveting the post of Mir Bakshi, and was left resentful and bitter. As an ac of revenge, he "impressed upon Nadir Shah that he had been duped by the latter who would have agreed to pay much more." 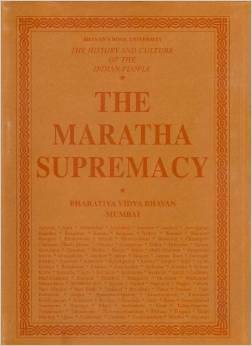 Not only that, he proposed that Nadir Shah take "Muhammad Shah, the Nizam and others into custody, march to Delhi and make himself master of the immense treasures in store there." Nadir Shah needed no second invitation. Just as Alauddin Khilji, four centuries before, had needed no second invitation for invading Chittor, at the instigation of Raghav Chetan. The Nizam-ul-Mulk was now asked by Nadir Shah to "furnish twenty crores of rupees"; and when he pleaded his inability, "was placed under surveillance." Muhammad Shah and his harem was also placed under custody. Nadir Shah march to Delhi, Muhammad Shah in tow. Two monarchs would be received at Delhi - "one a captive and the other a victor." Muhammad Shah was "permitted" to enter the city a day earlier to "enable him to accord a suitable welcome to his honourable visitor"! Thus, on the 20th of March, 1739, did Nadir Shah enter Delhi to a royal welcome. Towards the end of the day, rumours had started to swirl in the city that Nadir Shah had been "met with an untimely death or had been seized or imprisoned by the orders of the emperor." The Persian troops also were in a state of confusion on account of these rumours. In the ensuing disarray, about 3,000 of Nadir Shah's troops fell prey to the mobs that had collected at "various nooks and corners" and had begun to attack these troops. The next day, 21st of March 1739, As Nadir Shah rode through the streets to the Golden Mosque (Sunheri Masjid) in Chandi Chowk, "a bullet missed him, but killed one of his officers." "Mounting the roof of the mosque, red with anger, he ordered a general massacre of the inhabitants of the capital." The carnage began at 9.00 AM. Nadir Shah's soldiers killed all they could lay their hands on, anything of value was stolen, bazars and shops were set on fire - the carnage lasted for six hours. Several hundred women committed suicide. Approximately 20,000 people perished in this massacre. "The streets of Delhi lay littered with corpses for several days. ... Timber from the wrecked houses provided fuel for funeral pyres, on which the bodies of Muhammadans and Hindus were burnt ... Many thousands of corpses were collected and thrown into the Jamuna." The carnage over, looting was next on the agenda. A door-to-door survey was conducted, and according to one estimate, Nadir Shah obtained from the city of Delhi - its emperor, nobles, and its people - about 70,00,000 rupees. Also stolen was the Peacock throne, the Koh-i-noor diamond. Furthermore, soldiers were dispatched to Awadh "to bring the treasures of Burhan-ul-Mulk." "The accumulated wealth of 348 years changed hands in a moment." Third came the satisfaction of Nadir Shah's lust. A great grand-daughter of Aurangzeb was married to Nadir Shah's son, Nasrullah. "To celebrate the occasion, Nadir ordered illuminations, display of fireworks and lavish entertainments." Lastly, Nadir Shah held a durbar on May 12 (1739) and to which he invited Muhammad Shah and placed a crown on his head, thus vindicating "the long-standing claim of the Persian rulers, of their superiority to the Mughal sovereigns." Nadir Shah marched out of Delhi on 16th May, 1739. Based on my reading of the chapter, the massacre in Delhi by Nadir Shah's troops took place on MArch 21, 1739. However, the Wikipedia page on Nadir Shah states March 20, 1739. My piece on the ravaging of Delhi by Nadir Shah was first published in Swarajya on May 7th, 2015.